Boise Art Museum (BAM) plays a leadership role in the cultural life of its community through a growing Permanent Collection which focuses on regional and national artwork, nationally acclaimed exhibitions and an education program that reaches more than 13,000 students each year. 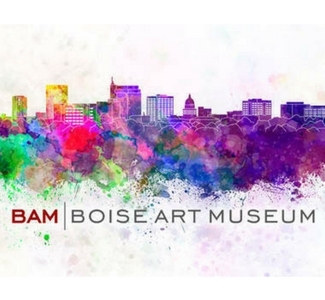 In 1997, BAM embarked upon a multi-million dollar campaign, supported by the City of Boise and the community, which enabled BAM to increase its facilities by 13,800 square feet to a total of 34,800 square feet. This most recent expansion reflects the Museum’s dedication to its Permanent Collection, display of multiple exhibitions, and educational programming. The Museum added five more galleries devoted to the display of its Permanent Collection, a 2,775 square foot sculpture court; an education wing comprised of three studios and an interactive children’s gallery; art storage vault, art prep area, and staff offices. As a result of the expansion and community support, BAM’s exhibitions, programming and attendance have grown significantly over the past several years.